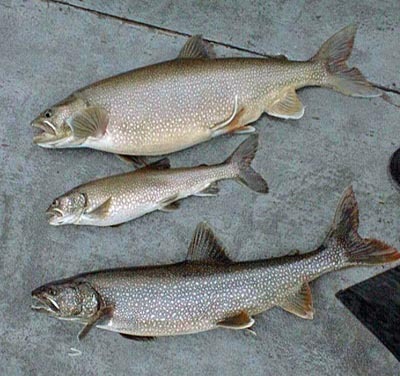 Lake trout can be a taste sensation any time of the year. The subtle light flavor is beauteous and the ease with which it can be cooked is incredible. Here’s to you and your lakers. At the campsite, this blackened recipe will be sure to please anyone. You will need a cast iron skillet for this to work properly. A Teflon coated skillet is fine, but we’re going all “old school” here. It is important to have the fish cut into sizes that are easy to work with. When filleting your fish, keep this in mind. Mix the Cajun seasoning and paprika in a bowl. Roll the trout fillets until covered completely while your skillet is getting hot. A HOT skillet is a necessity. DO NOT ADD THE FISH TO A COLD SKILLET OR I WILL FIND YOU! Saying it again: Heat the cast iron skillet until it is hot but not smoking. Dip the seasoned fillets in the melted butter and place in the—What kind of skillet again?—HOT skillet. Sear each side until black. This is a different type of recipe. The trout will be done through, but will be a bit cool on the inside. The Cajun flavoring will add a nice bite to the fish so I suggest having a cold drink next to you when you eat. Oh, and the wine is for the cook, not the fish! ENJOY! Here’s one of my favorite Lake trout recipes that feeds a few people and works well for parties and such. Can be used as a stand-alone meal or as a soup & salad lunch. Boil your fish and bone it completely. Cook the bacon and cook the onions in the bacon fat until softened and transparent. Boil the potatoes until tender. A fork should spear the cubes easily. Drain the potatoes, add the bacon, diced onions and REAL butter. Add milk, cover and simmer. Thicken with two (2) tablespoons corn starch combined with ¼ cup of water, if needed. This one will feed an army! A delicious soup for a cold day or when it’s simply too darn hot to use the oven or broiler. Try this in place of chili during football season, too. You’ll get all kinds of compliments and no, uhhh, shall we say, natural emissions. Thank you for trying out our Lake trout Recipes. If you have other recipes that you would like to share with the world, please contact us with the recipe.